Cable management is the insulation and installation of cables in electronic devices or communication systems to avoid detrimental situations; thus, it plays a crucial role in electricity and data transmission. The new-generation cable management systems consist of cable trays, conduits, raceways, optical fiber channels, and others. They are designed to possess a plethora of features and functions with high quality. Cable management ensures effective power distribution; provides enhanced safety, easier customization, and communication; and requires low maintenance. In addition, this system reduces the deployment time of systems, optimizes cable bandwidth, and provides maximum cable density. Service providers construct networks with high bandwidth worldwide, which require efficient fibers and strong management structure. Optical fiber cable management provides network reliability, better performance along with bend radius protection and physical protection. 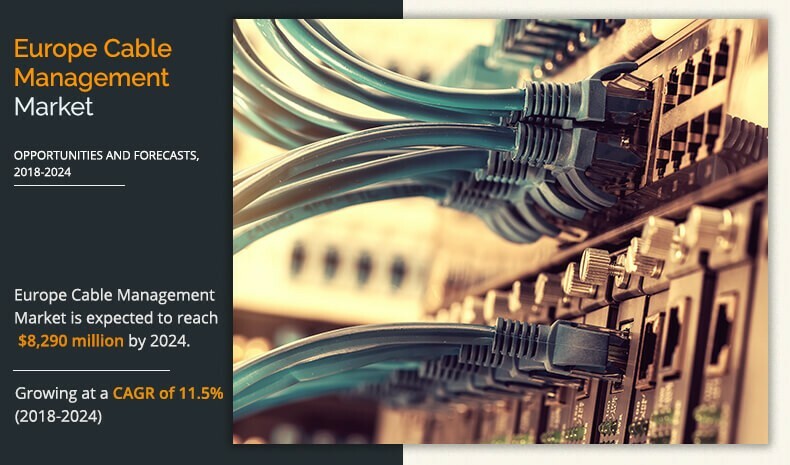 Rapid advancements in infrastructure & telecommunication and high frequency of repair and maintenance of the existing technology foster the growth of the Europe cable management market. However, intense competition among domestic players and variation in raw material prices restrain the market growth. On a positive note, growth of the IT & telecom and e-commerce sectors and increase in R&D activities for the development of 5G technology are anticipated to provide lucrative growth opportunities for the market from 2018 to 2025. The Europe cable management market is segmented on the basis of type, end-user industry, and geography. By type, the market is classified into distribution board, junction box, conduit, trunking, cable tray, bar, and others. The end users of the Europe cable management market include IT & telecom, commercial construction, healthcare, energy, manufacturing & automation, marine, mining, and others. Furthermore, the market has been studied across the European region, which consists of the UK, Germany, France, Russia, Italy, Spain, and rest of Europe. On the basis of End user, the construction industry serves as one of the most lucrative markets for cable management products such as metallic & nonmetallic cable trays, cable ladders, steel conduits, cable trunkings, cable piping & fittings, mounting equipment, and others. This is attributed to the fact that the Europe construction industry is presently growing exponentially. Energy industry is expected to grow at the highest CAGR during the forecast period owing to rise in demand for power consumption and lack of adequate power supply propel the demand for proper energy management. Cable management plays an important role in safety and longevity of photovoltaic (PV) systems, owing to the fact of extensive use of exposed cables in PV array. However, the overall investment in renewable fuels and power (barring huge projects of hydro-electricity) has considerably declined in the recent years. The major players in the Europe cable management market are Cooper Industries (Eaton), Legrand, Prysmian S.p.A., Atkore International Holdings Inc., Leviton Manufacturing Co., Inc., Panduit, Thomas & Betts (ABB group), Chatsworth Products, Nexans, Schneider Electric SE, and HellermannTyton. These players have maintained their market position with proposed quality maintenance and use of innovative technology such as fiber-optic runner channels to sustain the market competition. The leading manufacturers of cable management products have focused on expansion in new markets by acquiring regional players. In 2015, Prysmian acquired its rival, General Cable, to gain the customer base of North America. In the same year, Prysmian acquired GCDT, a Houston-based company, which designs and supplies downhole equipment for the oil & gas industry. Innovative product launch has been a key strategy adopted by market players to cater to the market demand. Panduit, one of the leaders in cable management products, established its R&D unit, the Jack E. Caveney Innovation Center, in Illinois in 2015 for R&D purposes. In addition, it launched the HD Flex Cabling system, which is designed to provide flexibility in data centers. After the economic crisis of 2009 in countries such as Germany, the UK, Netherlands, Russia, and France, the European economy has been on the recovering path since 2012. According to Fortune Global 500, 195 out of 500 manufacturing companies are headquartered in Europe. Leading European cable management providers, such as Prysmian, Nexans, Legrand, and others, have strong market presence. The latest European Economic Forecast 2018 report reveals that factors, such as synchronized global expansion, improvement in labor market conditions, and strong economic conditions, support the overall European development. The governments support for industrial amendments, policies, and regulations; surge in demand for infrastructure renovation; and capacity building have propelled the economic performance, and Europe has reached the GDP of 2.4% after a long recession. The European inflation rate of 1.5%, which was constant during 2017, propels industrial development and domestic demand across the European nations. This, in turn, drives the demand for cable management systems in the European region. An in-depth analysis has been presented after constructing market estimations for key market segments from 2017 and 2024. 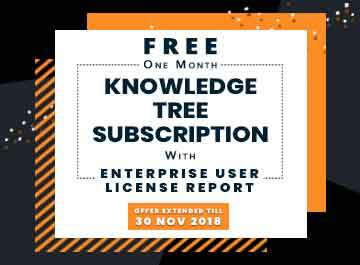 This report entails a detailed quantitative analysis of the current trends and future estimations from 2017 to 2024 to identify the prevailing market opportunities. An extensive analysis of the European market has been conducted by following key product positioning and monitoring the top competitors within the market framework. The current and future trends have been described in detail to gauge the overall attractiveness and detect lucrative trends to gain a stronger foothold in the market. 7.6. LEVITON MANUFACTURING CO., INC. The Europe cable management market is expected to grow at a significant rate from 2018 to 2025. The prime cause is rise in industrialization, which has facilitated the adoption of cable management products for various applications involving corrosive conditions, risky work locations, renewable energy, and others. Moreover, cable management products provide security and maintenance of wires and cables in industries, which propel their adoption; thereby, driving the market growth. Furthermore, companies offer innovative and compact cable management solutions to avoid harmful incidents because of exposed wires and cables. Companies in this market have been strengthening their R&D activities to provide customized and innovative cable management solutions. In addition, developing European economies have been investing significantly in various industries pertinent to cable management. Moreover, increase in residential construction, and industrial construction has fueled the adoption of cable management systems. These factors have been driving the growth of the market. The IT & telecom market needs to perpetually protect data centers and communication cables using cable management solutions. Thus, it has a steady demand for cable management products and is expected to continue to lead the market. Moreover, the energy and construction markets have high demand for cable management systems. Companies have been launching compact solutions with minimum maintenance and installation cost that encourage consumers to opt for cable management. In Europe, UK is expected to lead in revenue generation in this market during the forecast period 2018 to 2025, followed by Germany and France. 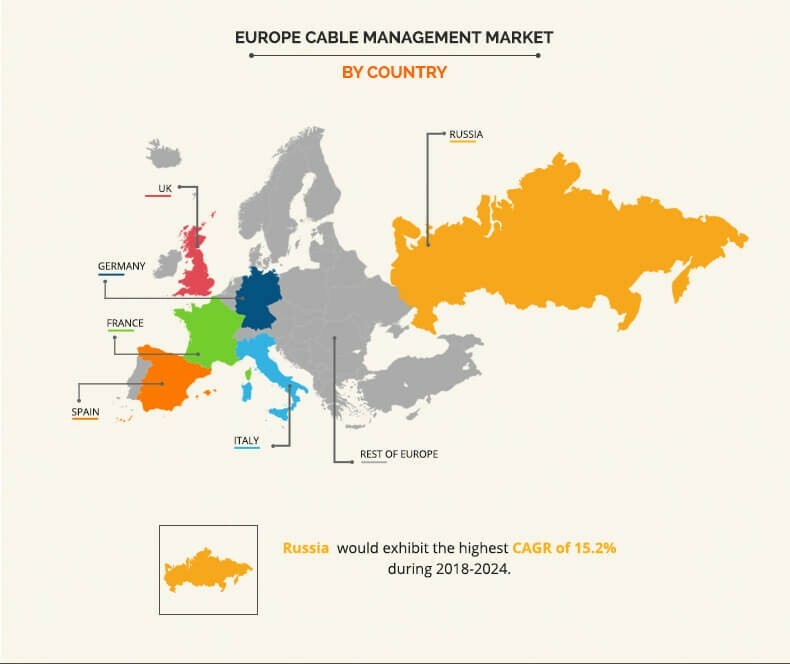 However, Russia is expected to grow at a higher growth rate, which could offer lucrative growth opportunities for players in the Europe cable management market during the forecast period 2018 to 2025. The major players operating in the cable management market are Cooper Industries (Eaton), Legrand, Prysmian S.p.A., Atkore International Holdings Inc., Leviton Manufacturing Co., Inc., Panduit, Thomas & Betts (ABB group), Chatsworth Products, Nexans, Schneider Electric SE, and HellermannTyton.